Beschreibung "Self-regulation in Private Law in Japan and Germany"
Special Issue No. 10 of the Journal of Japanese Law celebrates the 20th Anniversary of the Founding of the Journal and presents an up-to-date and comprehensive analysis of the role that self-regulation plays in private law in Japan and Germany. Self-regulation – sometimes also called soft law – is of growing relevance for both countries’ modern industrial societies. Some forms of self-regulation have stood the test of time, such as commercial customs or general contract terms. But there are also new types in the form of what is called “state induced” selfregulation. These emerge when governments delegate some of their traditional tasks to private institutions, as is increasingly the case. 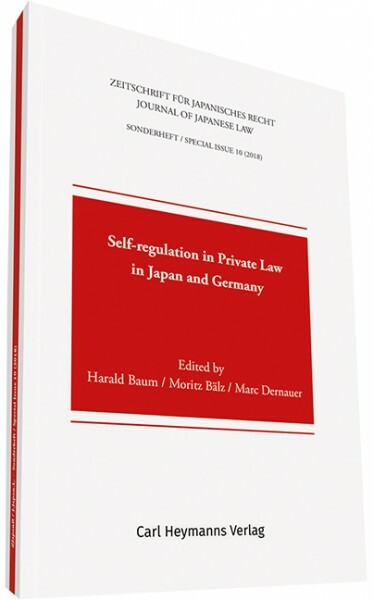 Leading private and commercial law scholars from Japan and Germany address the highly complex and diversifi ed phenomenon of self-regulation from a theoretical as well as practical perspective. The book is the first comparative study in this surprisingly under-researched area of law.